Honolulu’s Stand Up Comedy Scene continues to thrive & shine. Jose Dynamite & Patrick Tyrrell, the co-promoters of Comedy U (Comedy U Wednesday named BEST COMEDY NIGHT, by Honolulu Magazine’s “BEST OF HONOLULU 2017”), have teamed up with Jasmine Bautista, comedian & entrepreneur of “Just Being Honest Greeting Cards” to create a brand new night of stand up comedy, called “Stand Up On Stage” which occurs weekly, on Tuesday Nights. 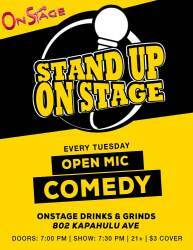 “Stand Up On Stage” is an open mic comedy night at On-Stage Drinks & Grinds, on Kapahulu. 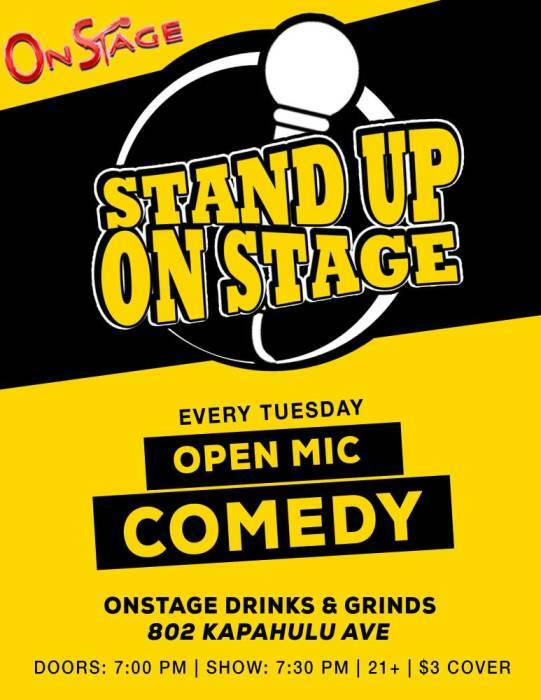 New and experienced comedians can sign up for stage time, and will be assigned either 4 minute sets or 7 minute sets, depending on their level of experience. The show will feature “double sign ups”, so that the comedians may get on stage a second time and work to develop their acts.